Taken together, Lamentation and Powers, Principalities, Thrones and Dominions represent something of a loose mythology two-parter for Millennium. The episodes are not linked by an explicit “to be continued…”, but they feed into one another in a very clear and structured manner. Each of the two episodes exists as a clear and independent entity, but – taken together – they exist as a story that shakes Millennium to its foundation. This is the point at which Millennium seems to know what it is and what it wants to be. The first season of any show is a difficult time. Everybody working on the series struggles to find the right voice for the series. The goal is to figure out what the show is before the audience loses interest. Lamentation comes quite late in the first season – only four episodes from here to Paper Dove – but it does represent a very clear and dynamic shift. It follows through on a lot of the horror implied throughout the first season, suggesting that Frank Black might be facing something far more sinister and insidious than mere serial killers. In fact, Lamentation exists as a fiendish subversion. It is a story that is very clearly set-up as the sort of procedural serial-killer-of-the-week story that the show was churning out towards the middle of the season. Doctor Ephraim Fabricant is released from prison so he can offer a kidney transplant to his sister; however, while he is recuperating, somebody helps him to escape police custody. Having profiled Fabricant during the initial manhunt, Frank is drafted in to track down Ephraim Fabricant before he inevitably starts killing again. The clock is ticking. Then everything just explodes. Something from the dark heart of Millennium breaks loose; this more primal evil devours the serial-killer-of-the-week structure. It even leaves his second kidney on a plate in the fridge. Lamentation is a beautiful example of bait-and-switch. Chris Carter sets up one type of very familiar story, and then delivers on something that has been lurking in the background since The Pilot. Described as “the base sum of all evil”, the entity unleashed within Lamentation just tears through the familiar narrative structure. Disguising itself as Lucy Butler, this incredible presence shreds the story around it. It seems like Millennium cannot contain it. Lamentation is a beautiful example of catching the audience off-guard. Carter plays fair with his viewers. From the start, it seems like Lamentation is a particularly archetypal serial killer story. Carter has made no secret of the influence of Thomas Harris on his work, and Lamentation makes no effort to hide the fact that Doctor Ephraim Fabricant is a bargain-basement Hannibal Lecter. Lamentation does not just trash any conventional serial killer narrative, it goes for the jugular of the most influential serial killer story of all time. Carter has been undeniably influenced by Silence of the Lambs, which makes subverting the set-up so much fun. Fabricant is very clearly modelled on Lecter. The names are suitably eccentric, the character is introduced as witty, and actor Alex Diakun does a passable Anthony Hopkins impression. Like Lecter, Fabricant is a qualified surgeon who has put his medical experience to horrific use. Like Lecter, we discover that Fabricant has attacked nurses in the past. 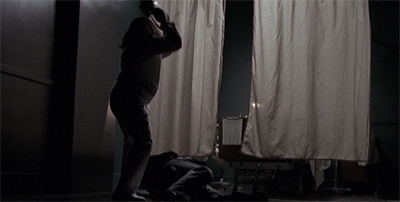 Like Lecter, he is moved from his secure environment to a more relaxed facility for a humane purpose; both Lecter and Fabricant escape while out of their usual secure environment. There is something very familiar about the set-up to Lamentation. Once again, Frank finds himself returning to an old psychological profile to stop more violence. Even Frank seems fatigued by it. “I’m here to help catch him, just the way I helped catch him once before,” Frank tells the Behavioural Science Unit in Quantico. It just keeps happening over and over and over again. This is just another case; it might be interchangeable with Kingdom Come or Wide Open or Weeds or Sacrament. Lamentation is a particularly ruthless switcheroo. The guest cast cleverly lists Alex Diakun ahead of Sarah-Jane Redmond; this implies that Ephriam Fabricant is the most important guest cast member and that Lucy Butler is just a supporting player. There are rules and formulas for these sorts of stories, and the beauty in Lamentation is how fantastically the episode subverts all those rules and formulas. Suddenly Frank Black is not in the kind of story that he thought he was in, and the audience is not watching the kind of story that they thought they were watching. It turns out that Lucy Butler is not Ephriam Fabricant’s salvation, but his damnation. She did not help him escape so that he might continue working, she captured him so that she might torture him herself. Suddenly, Lucy Butler is not just Fabricant’s lover or associate, he is her victim. It is a beautifully twisted reversal, one which sees the forces of darkness laying siege to the iconic yellow house. That sacred space is violated and invaded by some entity of pure unbridled evil, while Frank Black remains trapped in the hospital as part of the plot involving Ephriam Fabricant. It seems like the show has finally figured that out, albeit quite late in the season. Finally the ambiguous and pervading sense of evil suggested in The Pilot, Gehenna and The Judge is given form. It is no coincidence that the demon approaching Bletcher at the climax boasts the same design as the one glimpsed fleetingly in Gehenna. Looking into the eye of evil! I’ve always said The X-Files is about extreme possibility. Conversely, Millennium, you could say, is about possible extremes. And, ultimately, it’s about evil. And it’s something that people can think about. Evil is greater than us and, in its own way, something spiritual, too. Millennium generally portrays evil in a spiritual or religious context. After all, the Frenchman in The Pilot was quoting biblical prophecy and the monster in Gehenna was explicitly demonic. Mulder and Scully (stand-ins) cameo! It really is an exploration of evil on the show, the now scientific approach to the explanation of evil which is a psychological one, which says everyone is a victim of something. I was interested in the unscientific approach, so the Bible plays an important role in the show. It’s not a show about the Bible, yet you’ll find a lot of these stories are in there and have been told before, so it gives the show a nice foundation, it attempts to explain things on various levels not just in the modern scientific way. 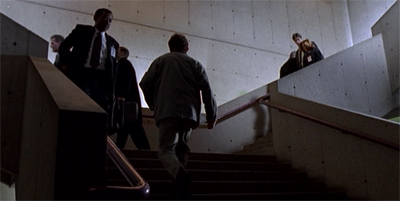 This is a recurring theme of Carter’s work, even reflected in certain episodes of The X-Files – shows like Grotesque and Empedocles suggest that evil is contagious; Piper Maru makes it infectious. There is an argument to be made about whether Carter’s absolutist vision of evil actually exists, but it makes for fascinating storytelling. Translating a biblical verse quoted in an email, Frank reflects, “The killer is saying that evil begets itself. Fabricant told the woman he married in prison that he wanted to have a child.” It seems like a recurring nightmare on Millennium, the idea that madness and insanity are spreading and multiplying as the new millennium approaches. There is a grim sense of inevitability to it all, that sense that things will inevitably get worse as the tide of evil rises. Violence leads to more violence, evil pays back only evil. Lamentation and Powers, Principalities, Thrones and Dominions suggest a self-sustaining and self-perpetuating evil at work in the world. It seems that characters like Lucy Butler and Alistair Pepper exist as agents of some higher power that uses them merely to facilitate the spread and growth of evil in the world. Lucy Butler considers starting a family with a serial killer, while Alistair Pepper defends and exonerates criminals so that they may continue to conduct their vile business. This idea of evil beyond science plays a major part of Lamentation. Frank Black argued that Ephriam Fabricant should have been kept alive so that he might offer science a glimpse into pure evil. However, it seems that he has not really taught Frank that much. During the briefing, one of the agents asks about Fabricant’s motivations, “Freedom? To avoid re-incarceration?” Frank replies, simply, “If you’d read my profile on him you’d know that freedom to him is only the freedom to kill.” That doesn’t seem like a particular nuanced understanding of pure evil. It is worth noting that Frank does not abandon reason. In fact, one of the big plot points in Power, Principalities, Thrones and Dominions is the idea that Frank will continue to ask “why?”, even in the face of something obviously beyond mortal comprehension. Lamentation confronts Frank with a pure form of evil that exists beyond his ability to fathom, but Power, Principalities, Thrones and Dominions insists that Frank will still respond by trying to understand it. That is who Frank Black is, and that is what he does. Lamentation escalates the threat to the yellow house that has been building since The Pilot. There, a collection of anonymous polaroids served to demonstrate that Frank could not keep his family completely safe. Over the course of the first season, evil seemed to circle the Black family – slowly encroaching on the safe space that Frank had tried to create for them in their new home. Weeds featured a killer who left a letter at the house next door; Sacrament featured the abduction of Frank’s sister-in-law and the implication that Jordan might have her father’s gift. However, Lamentation forgoes the slow boil build up and just brutally violates the safety of the family home. There is no messing around; this level of attack has not been foreshadowed or signposted ahead of time. Catherine receives no warning. The first half of the episode makes it clear that the forces of darkness have Frank’s address and are sending him creepy polaroids, but that is nothing that the audience hasn’t known since The Pilot. Then the lights go dark, there is a human kidney in the fridge, a family friend is left hanging in the basement with his throat cut. There is a brutal escalation here, one that gives Lamentation a raw and visceral power. This momentum and shock help the audience to gloss over any potential problems. After all, Millennium is not a subtle treatise on evil. The show is capable of nuance and tact, but not when dealing with its big themes. There are points throughout the run when it feels like the show is taking out a gigantic bullhorn and shouting “EVIL!” at the top of its lungs. However, there is something absolutely beautiful about the way that show can commit to that philosophy. The idea of the perversion of family runs through Lamentation – just as it runs through a lot of the first season of Millennium. Lucy Butler is married to Ephriam Fabricant. Trying to deduce Fabricant’s motivations, Frank suggests, “He wants to have a child.” As such, Butler and Fabricant present a rather chilling version of the nuclear family. Lamentation is somewhat ambiguous as to whether Lucy Butler was considering carrying Fabricant’s child, forming a grotesque parody of a healthy family. We don’t learn too much about Lucy Butler, but we do learn that she most likely killed her own son four years before the events of the episode. As such, Lucy Butler represents the ultimate perversion of parental responsibility; a mother who would kill her own child. It is a shocking betrayal, one that Millennium wrestled with in Covenant. Her later appearances will play up this idea of Butler as a perverse and twisted mother. A Room With No View features her attempts to kill anything special inside young teenagers, Antipas positions her as a nanny. It is interesting to wonder why Lucy Butler tortures Ephriam Fabricant so sadistically. Obviously, it provides a nice metaphor for the way that more primal evils are chewing through the serial killer format, but what was her motivation? Lamentation cleverly leaves it ambiguous, making the violence seem more random and scary. Did Lucy even have a reason? Did she need one? Was she punishing Fabricant because he seemed to be seeking some form of redemption, donating his kidney to his sister and “the only other act of redemption he’s capable of”? There is no way to know, but it is more effective that way. These sorts of questions are best left dangling, asking the audience to reach their own conclusions or figure out their own perspective on the matter. The implication is that Lucy Butler represents a particularly vicious and brutal form of evil, one foreign and alien to Frank Black. Her very presence changes the rules and escalates the situation dramatically. Things are changing; they will never be the same again. You can’t go home again, especially after Lucy has redecorated. There is a sense that Millennium is drawing its evil in very broad strokes. In Lamentation, Lucy Butler is presented as an almost seductive female demon; in Powers, Principalities, Thrones and Dominions, Alistair Pepper is an amoral lawyer who gets guilty clients off the hook. Boy, will their faces be red! Lamentation is also notable for the death of Bob Bletcher. It is perhaps too much to describe Bletcher as an essential part of Millennium at this point; one of the big recurring problems with the show has been the way that it hasn’t really developed its supporting player. Bletcher is familiar to the audience at this point, but the show has never bothered to tell us anything about him. The show has established his importance to Frank, and suggested that he is perhaps more willing to bend or break the rules, but there is little beyond that. Nevertheless, the death of Bob Bletcher is striking. This is the death of one of the show’s supporting cast in the basement of the yellow house. It is the murder of Frank Black’s best friend in the very place he has created as a safe haven for his family. More than that, the fact that Bob Bletcher dies in the basement serves as a nice reminder that evil has already infiltrated the Black household; as Tom argued in Sacrament, Frank cannot keep all that evil locked up in the basement and expect to live a happy and wholesome family life. What worked with Bill Smitrovich and Lance Henriksen as far as casting goes – they’d never been in the room together before this – was that they’re both very powerful personalities and there was a sort of competition going on between the two of them both on-screen and off. It worked, it created a nice tension between the two of them. 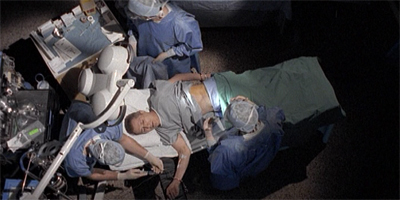 Unlike other characters who died on both Millennium and The X-Files, Bill Smitrovich never really reprised the role. Outside of a short appearance in Powers, Principalities, Thrones and Dominions, Smitrovich pretty much finished with Millennium. It is a shame. Lamentation and Powers, Principalities, Thrones and Dominions come with some of the problems that have bothered Millennium since the start. For one thing, it is quite clear that the show has no real idea about what to do with the character of Catherine Black. Episodes like Blood Relatives, The Well-Worn Lock and Wide Open tried to work Catherine into the primary plot to varying degrees of success. There was a clear sense of progress, even if it seemed unlikely that Catherine Black would ever be as prominent on Millennium as Scully is on The X-Files. However, the show’s own identity issues seem to have taken precedence since that stretch. Coming out of the rather formulaic serial killer stories in the middle of the season, Millennium has worked hard to reinvent itself. As a result, it would appear that Catherine is once again primarily characterised as the “loving wife to be protected.” Catherine is more useful as a representation of Frank’s family life than as a character in her own right. Lamentation wrings a lot of drama from the fact that Frank is not able to protect Catherine when he really should be. Lamentation is the third of four Millennium episodes to be directed by Star Trek veteran Winrich Kolbe. Kolbe did great work on the show, and he makes Lamentation a suitably haunting and kinetic piece of television. He nails each of the episode’s key genre transitions, from jail break to serial killer to haunted house. Lamentation is a delightfully atmospheric piece of work, an episode that relies on a director conversant in the language of television. Lamentation is an example of script and director working perfectly in harmony. However, these faults are ultimately quite minor. Lamentation is a fast-moving roller-coaster of an episode and an absolute delight. It is an example of Millennium firing on all cylinders.